Win, lose or draw, playing in the TaylorMade Junior Interclub Championship is just one of the many options many juniors enjoy as part of the ClubLink experience. Whether participating in the TaylorMade Junior Interclub Championship is a reward from a coach for working extra hard or having to go through a competitive qualifier at their home club, junior golf at ClubLink comes down to developing a passion for the game, while having fun, making friends and learning to play better golf one day at a time. “I have been hitting balls at Heron Point with my dad (Doug) since I was four,” says 13-year-old Lucas Smith, who hangs out at the club four days a week during the summer, while also playing travel baseball for the Ancaster Diamondbacks. 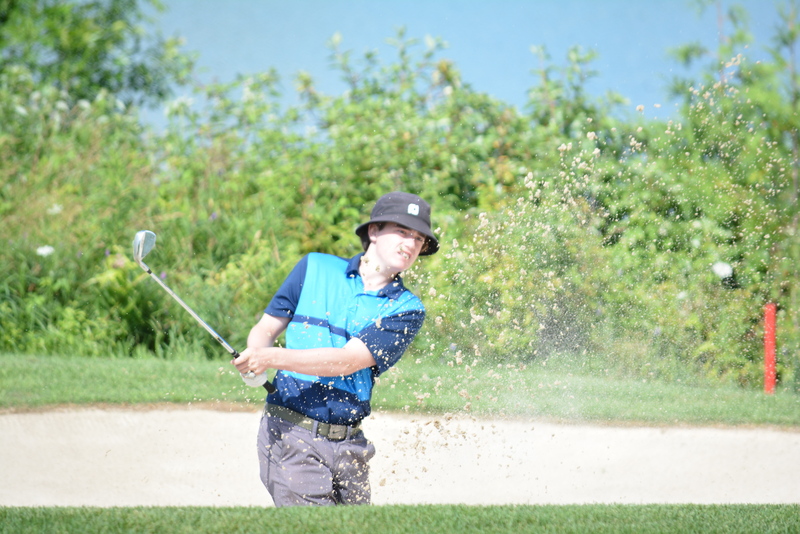 Lucas has been a ClubLink Junior Twilight member since the age of five and he’s hoping that if he finally beats his dad this summer, that Doug will get him a full Junior membership for 2019 – then there will be no stopping his passion for the game. The Junior Twilight program allows youngsters the opportunity to use the range any time of day and golf after 5 pm. “I guess you could say I’m a range rat,” Lucas says, while Heron Point Associate Professional, Morgan Burjaw nods his head in agreement. “I can go out there and hit several hundred balls until I can’t hold the club anymore and then I’ll go to the putting green to work on that. I love it,” says Lucas, who weighs in at 90 pounds and drives the ball 235 yards with confidence. It’s only been a few months, but Marcus Piche from GreyHawk Golf Club in Ottawa is also enjoying his ClubLink experience. After deciding to join GreyHawk as a Junior Member last winter, the 15-year-old attended a ClubLink Job Fair at the club. He picked up a back shop position cleaning clubs, moving carts and assisting members with their golf bags. “I try to be at the club seven days a week. If I’m not working, I’m there practicing or playing and if I’m working I try to play before or after, sometimes both,” adds Marcus, who is an 11 handicap. “I have a great group of friends there and there’s an opportunity to play 36 holes, so you can’t beat that. Five years ago, when Desi Primeau first showed up at Hidden Lake Golf Club to whack the ball around the course he couldn’t break 100, but it was close on good days! Three years ago, he was playing his slice in a late afternoon round, when teaching professional, David Banks took notice and suggested some lessons might be in order to turn his slapshot into a golf swing. Desi is still working in the back shop and he’s addicted to the game playing or working until nightfall seven days a week. “I don’t know what else I would do if I didn’t play golf,” he says, as his coach and teammates listen to the conversation. “NBA, no. NFL, no. MLB, maybe, not really. Cricket, that might be worth a shot. I’ll stick with golf,” says the 18-year-old, who is now a three handicap and won Hidden Lake’s Junior Club Championship in 2017. Desi’s teammate, Owen Kim, was just back from competing in the U-19 Ontario Junior Boys Golf Championship at Loyalist Golf Club where he shot rounds of 78-72-76-79 to finish 28th overall in his first appearance. The great part about this story is that Owen is just 13 years old! “It’s my third time playing in the junior interclub. It’s a fun day being out here with my friends and our coach, learning from him and maybe teaching him a thing or two, and they give out great prizes from TaylorMade to all of the teams,” Owen adds. The champions of this year’s event, well that was pretty much an unbelievable story all on its own. 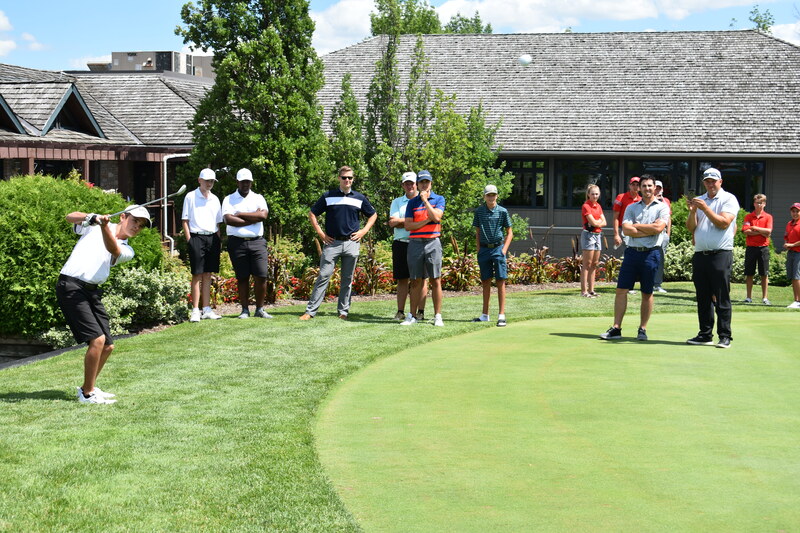 Two squads from Club de golf Fontainebleau near Montreal piled into a van with coaches Yannick LaForest and Antoine St. Jean and travelled to the GTA where they played a practice round at Station Creek Golf Club. After a night in a local hotel strategizing, or chilling, they headed to Blue Springs Golf Club where the Junior Interclub Championship was played for the first time. Without ever having seen the course, the two teams finished the round tied at 22-under and went to a chip off tiebreaker to determine the winner after already having packed their clubs in the van for the trip back to Fontainebleau. In the blind chip off, Thomas Robitaille hit first leaving his ball about eight feet from the cup. Having turned his back and having no idea how close he needed to be, Robitaille’s good buddy, Thomas Benoit, hit next, but went long. They boys had to re-pack the van with the added bonus of trophies and new TaylorMade drivers for the winners and fairway woods for the runners-up. Thomas Robitaille was all smiles after making the winning chip shot and who could blame him. Last year, his Fontainebleau team finished dead last in the championship and this year, in his second year playing in it, they won it all. The winning Fontainebleau team included: Thomas Robitaille, Jerome Lee Durivage, Victor Murray and professional Yannick LaForest and the second-place team included Thomas Robillard, Thomas Benoit, Frederick Deschampes and professional Antoine St. Jean. Hidden Lake finished third at 20-under par, followed by National Pines at 16-under. There was a three-way tie at 13-under between GreyHawk, Heron Point and Wyndance. For more information on ClubLink's Special Events, click here.